Refer to the Colour Preferences topic in this chapter to learn how to enable and disable the Element Palette List mode. The Scene Palette List is mainly used with cut-out animation. A cut-out character will often be divided in twenty to thirty different drawing elements that use the character’s master palette. The Scene Palette List is the simplest one to use. 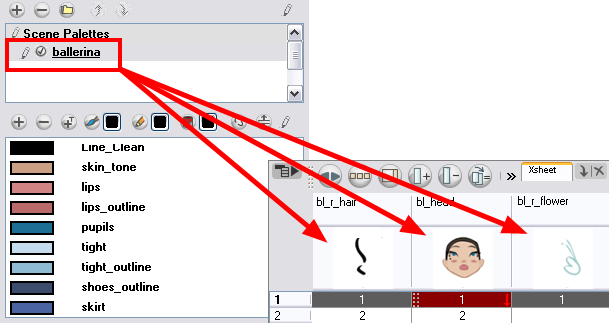 By default, Toon Boom Animate Pro is set to use only Scene Palette Lists. 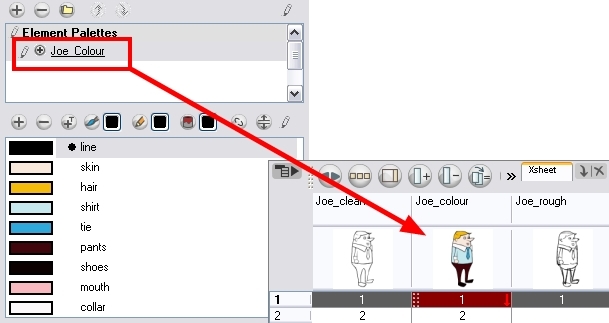 In Toon Boom Animate Pro, you can switch to Advanced Palette Lists mode and choose to save your palette at an element’s level. The Element Palette List is mainly used with Traditional and Paperless animation. Unlike Cut-out animation, all columns (drawing elements) contain different characters, props, backgrounds and effects. The Element Palette List is used because you do not necessarily want all of the palettes for all of your elements linked in every column.